This traditional house in a leafy Ford’s Colony neighborhood had a nice setting, but the back yard was looking a bit uninspired. Sure, there was a nice deck at the back of the house, but without a focal point in the yard, there wasn’t really anything to draw the family out into the yard. 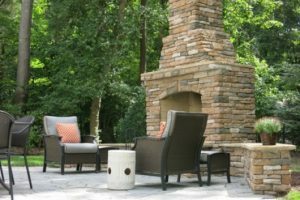 An outdoor fireplace was just the thing to entice the family and guests to leave the house and enjoy nature. 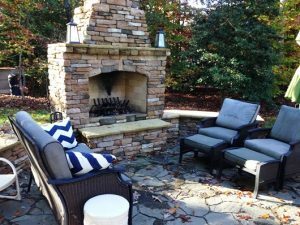 The clients had been thinking about an outdoor fireplace for while and had collected a few images of what they had in mind. It’s always very helpful when clients provide us with images of hardscape or plantings that they like. It saves a lot of time in developing concepts and it helps to insure that the clients are getting exactly what they want. 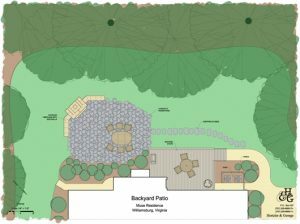 The final plan we developed included a fireplace, a patio surrounded by a planting bed, and an inviting stepping stone path to draw people down from the deck. 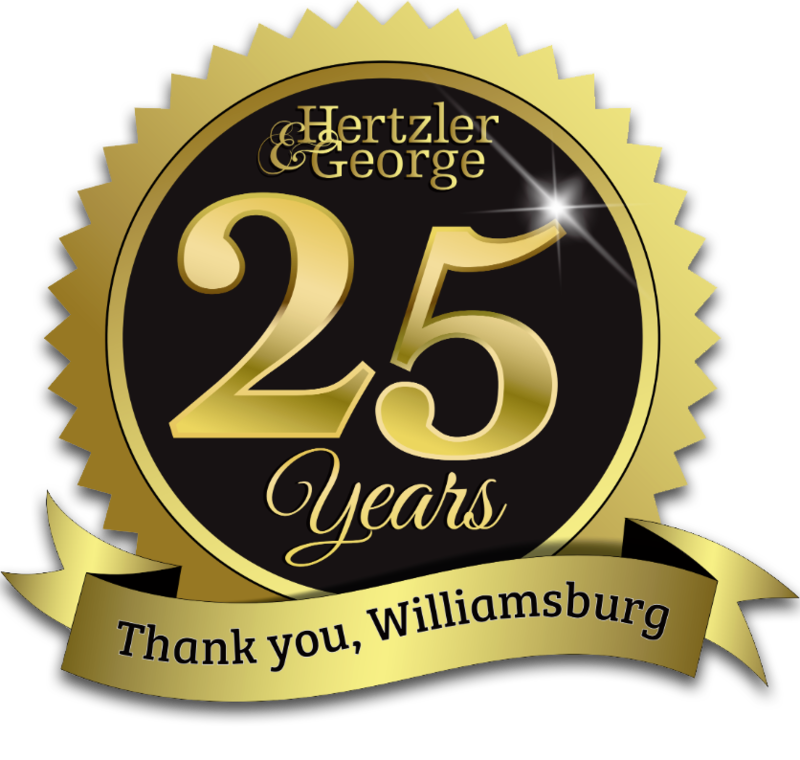 As with many of our projects, we worked with Yorktown Materials to find the right materials to bring the project to life. 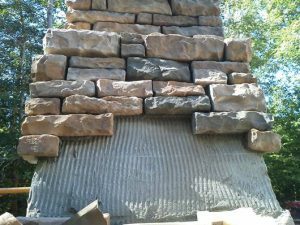 Natural stone would have been a great choice for the fireplace, but it wasn’t within the client’s budget. 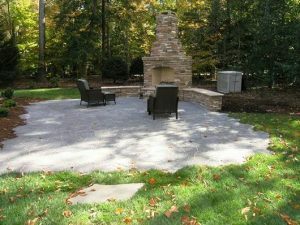 To keep costs down, they opted for a man-made veneer applied to a concrete fireplace kit by Firerock. The veneer the clients chose was Shadow Ledgestone, manufactured by Ply-gem, in the ‘Autumn’ color. This veneer went up easily, giving the look of stone at a much lower price. 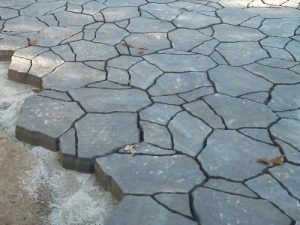 For the paving, the clients selected Belgard Mega-Arbel in the ‘Belgian Stone’ color. This irregularly shaped paver gives the look of natural, irregular flagstone, and it looks great in combination with the fireplace veneer. 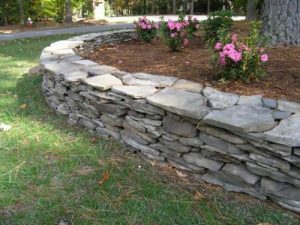 As part of this project we also built a low stacked stone wall using Pennsylvania field stone in the front yard to give some definition to the lawn.